This can be clearly seen in the infrared aerial photo below. The road winding east-west across the center of the photo separates Sylvania to the south from the Ottawa National Forest to the north. Since the photo was taken during the leaf-off season, the dark areas are coniferous (hemlock) patches and the light areas are the hardwood patches. The boundary of the wilderness shows clearly because of its extensive hemlock stands in the old-growth forest. Massive logging about 50 years ago, extending right up to the wilderness, converted the patchy hemlock/hardwoods forest to one dominated by stands of hardwoods (second-growth forest). In winter, deer gather in coniferous forests not only because conifers provide greater protection than leafless hardwoods, but hemlock foliage also is one of their prefered foods. They also love seedlings tall enough to project above the snow. Hemlock seedlings, once browsed, are not able to resprout as vigorously as other tree species. Browsing can seriously affect reproduction with deer densities above 8 to 10 deer/mile2 (3-5 deer/km2). However, deer browsing alone is most likely not the only factor (Mladenoff and Stearns 1993). Disturbances in the forest have been found to favor sugar maple. For example, evidence of disturbance in the pollen core in the form of charcoal (implying a fire) or a spike in birch pollen (which requires sunlight) in a mixed hemlock/sugar maple stand tends to be followed by a change to mostly sugar maple which grows faster and therefore responds more quickly to gaps (Davis et al. 1995). Hemlocks have a shallow root system which makes them susceptible to drought and to windthrow. 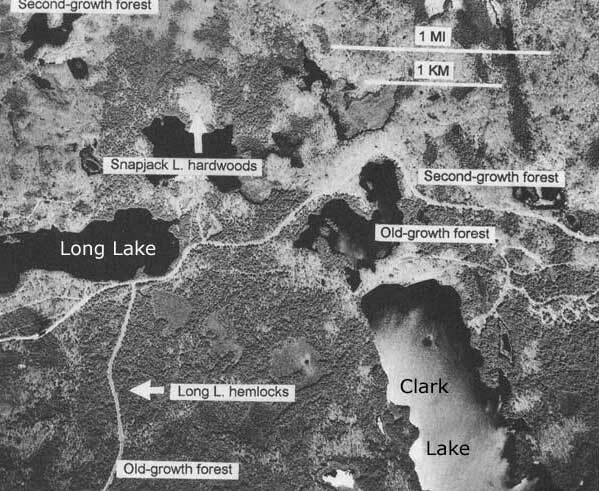 Tree ring analysis showed that gaps in the forest canopy formed more frequently during drought periods, and that sugar maple took advantage of the reduced competition for water, light, and nutrients more quickly than hemlock. It can be seen from the above that the future of hemlock in Sylvania is somewhat tenuous and faces many threats. Hemlock would most likely benefit from a decrease in deer browsing. In addition, further studies of the effects of drought, invasive earthworms, and other environmental changes on hemlock are needed.